Or 2, maybe 3 or 4. Before we are done it may be a dozen or more. What do you think? How do they look? 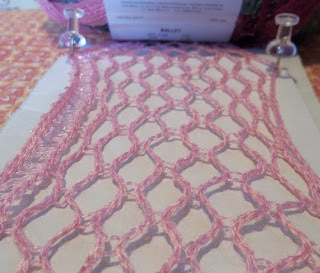 I found this yarn at Michaels, they also had it at Joanne's. I immediately saw scarves for Jaynie. They had other colors, I may need to go back and buy more. These were the easiest thing ever, just cut a length of yarn. 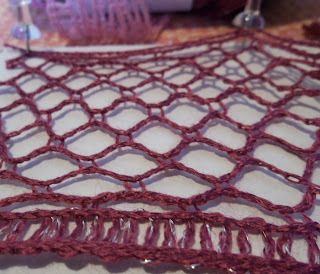 I like the mix of grey and maroon, I need to cut another scarf. I'm thinking that it my make a good throw blanket by sewing strips together. This is what it looks like streched out. 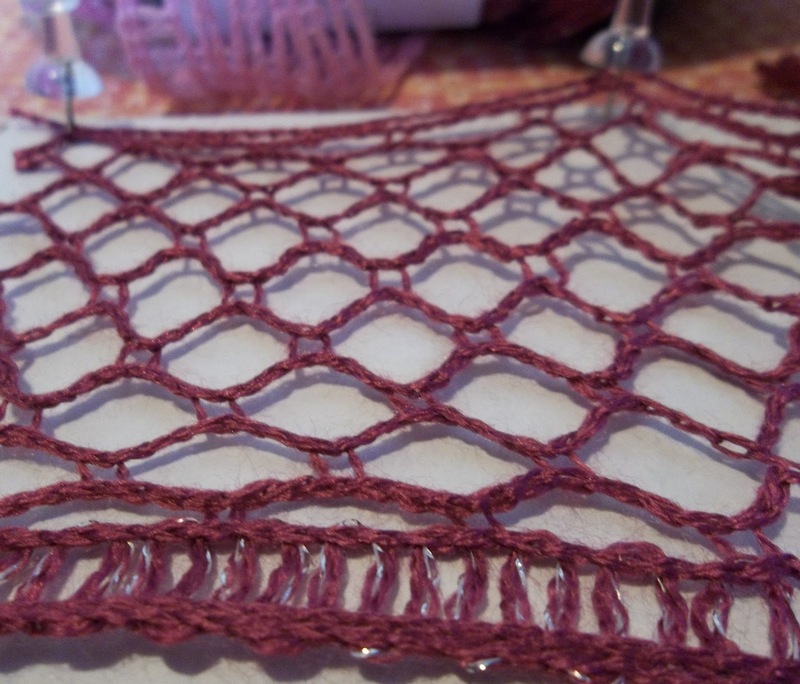 I think that it may look nice stretched over a solid color pillow, maybe even plain muslin. Would you like some of this in you gift package if you win my give-away. 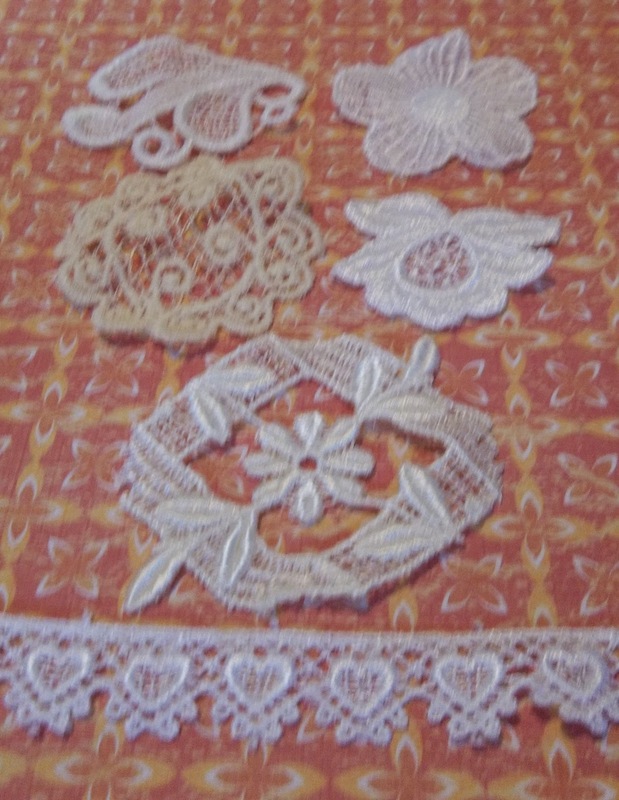 I sorted through some pieces of lace, I found some doilies and a heart border. Would you like to have any of these? My heart and thoughts are with everyone effected by the bombings at the Boston Marathon on Monday. Many will have long recoveries, some will never recover. Many are tramatized and will never forget what they saw. Many have had losses that will be so very hard to bear. Many also have many hours of work ahead helping in the recoveries. Please put them in your thoughts and prayers, they will need them all. The scarfs are really nice. I love the one around Jaynie's neck best. 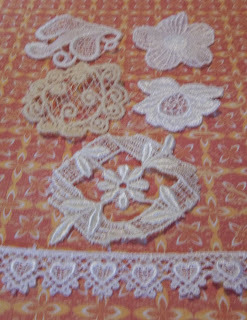 The lace pieces are beautiful, especially the hearts. Others will forget soon but not the families of those gone and not the injured who face a long recovery time. This is a sad time for all. Hi Drora, The blended colors does make that scarf a bit more interesting, doesn't it, I like the blend of the grey and maroon also. We move on but it always holds a little spot in our hearts, hopefully it helps remind us to more loving and caring to counter the hate and violence that some try to spread. Hi Jennifer, My husband avoids going to the crafts stores with me because I take so much looking at everything. Hola Mary, gracias por visitar mi blog, ya tienes una seguidora más. Tienes un blog muy bonito. La lana y los encajes son preciosos.